The United States spends more money on health care by far than any other country and yet nearly 50,000,000 Americans are uninsured at least part of the time each year. 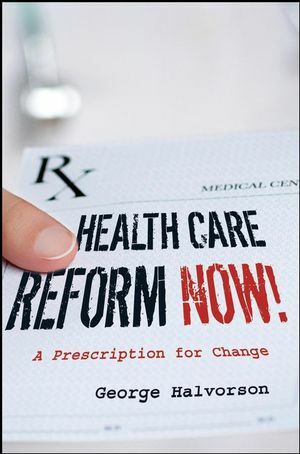 Health Care Reform Now! is written for anyone who cares enough about our health care situation to consider serious alternatives to the current system. In this book George Halvorson—an internationally known health care leader and author—offers a sensible approach to health care reform and universal coverage that can work for all stakeholders. Step by step, George Halvorson outlines a game plan for a truly world-class health care system that will appeal to policy makers on both ends of the political spectrum and will deliver health care with improved quality, better access, provider accountability, performance transparency, consumer choice, and individual empowerment. George Halvorson, is chairman and CEO of Kaiser Foundation Health Plan and Hospitals, Oakland, California. He was president and CEO of HealthPartners in Minneapolis, Minnesota. He is the coauthor of Epidemic of Care and author of Strong Medicine. 1. A Few Hard but Useful Truths. 2. Data: The Missing Link for Health Care Reform. 3. What Do We Do Until the E mr Arrives? 4. Basic Steps to Improve Care for Chronic Disease Patients. 5. Eight Developments That Finally Make Health Care Reform Possible. 6. Making the Market Work for Health Care. 7. A New Idea: The Infrastructure Vendor. 8. Who Should We Hire to Reform Our Health Care Infrastructure? 9. Next Steps and Expectations. 12. So What Should We Do Now?